This page is a combo "review and how-to-install-on-the-S2000" writeup of the PLX devices M-400/M-500 wideband 02 Sensor and datalogger unit. (and I am in no way affiliated with PLX devices). When making engine modifications, it is important to monitor certain critical aspects of engine operation. One of the most important is the Air-to-Fuel present during the combustion process. While operating under heavy load, for example, it is important for an engine's Air-to-Fuel ratio not to become too lean (ie- too much air and too little fuel), as the fuel acts as a coolant in the combustion chamber, preventing severe damage to the engine. 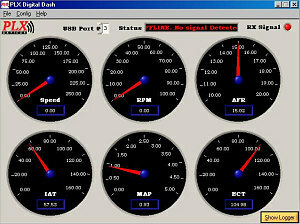 An important tool, then, is instrumentation to monitor the Air-Fuel ratio. Typically this is done by installing a gauge to read the ratio, and using a replacement wideband oxygen sensor in the exhaust that has a wider and more constant range of sensor voltages. After reading about the various products offered on the market, I came across a very nice device made by a company called PLX devices. What drew me to the device was (a) a reasonable price which included a display unit AND the wideband oxygen sensor, and (b) a "narrowband" oxygen sensor output that allows one to replace the standard factory sensor while "fooling" the car's ECU into thinking the original sensor is being used. This eliminates the need to keep the standard oxygen sensor and having to create a new hole in the exhaust to mount the wideband oxygen sensor. Using this setup, the existing sensor is replaced by the new sensor. On top of this functionality (for the M-400 and M-500) is a generic 6-channel datalogging capability, that, if hooked up, allows you to monitor 2 pulsed signals and 4 analog signals. These can be attached to factory sensor inputs or other sensor inputs of your own. The datalogger connects to software on your laptop by means of a wireless USB connection between the PLX controller and your laptop. Very handy for recording dyno runs, track runs, or whatever else you can think of. 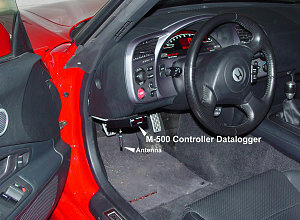 The installation instructions on this page are specific to the 2000 to 2003 model years of the Honda S2000. I believe (but am not positive) that the install is exactly the same for 2004+ models as well, but I can't be absolutely positive, so be sure to check the 2004+ factory service manual to be sure that the wire colors haven't changed. A PLX Devices M-400 or M-500 kit (M-300 is the same, minus the datalogging stuff). Specifically, I'm talking about the full version of the kit that includes the 02 sensor, all harnesses, etc. A 20-ohm, 10-watt resistor (or a set of resistors that result in the same effective resistance). This resistor will simulate the resistance of the heater unit in the factory 02 sensor (which you are going to replace with the supplied wideband sensor). note: not supplied in the kit - you need to buy this part separately. some 18 to 22-Gauge stranded wire in various colors (makes things easier when you can use different colors). You don't need much, maybe 5 or 6 feet in total. A crimper tool, wire stripper, and wire cutter. Connect the "narrowband" output of the control/display unit to the car's ECU. Put a resistor across the primary 02 Heater circuit coming from the car's ECU. splice wires from the data logger inputs into the various sensors you want to monitor on the car. I chose to monitor engine speed, road speed, air/fuel ratio, intake air temperature, intake air pressure, and engine coolant temperature. The ECU is behind the kick panel to the left of the clutch. This panel must be removed to gain access to the ECU and its wiring harnesses. The ECU has 3 main harnesses feeding into it. These these harnesses connect into the ECU using detachable plastic connectors. From back-of-car to front-of-car, these connectors are labelled "A", "B", and "C" (as in, the connector closest to the back of the car is connector "A", the one in the middle is connector "B", and the one closest to the front is connector "C"). 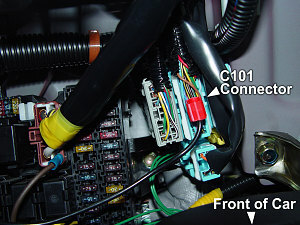 The other relevant connectors are C101 and C404 (one wire needs to be spliced from either C101 or C404 as part of the installation of the 02 heater resistor). NOTE: Picture 4(at the bottom) is a schematic of the existing relevant circuitry with the PLX deviced wired in place. The modifications required (and in fact, anything "new") are colored in orange. I've also labelled the wire colors I used in my particular installation. Referring to this diagram often should greatly increase the understanding of what connects to what. 1) Install the wideband 02 sensor as per the instructions that come with the PLX device. Essentially this involves disconnecting the old 02 sensor and its harness, installing the new sensor, and running the supplied harness all the way up and through the firewall to the engine compartment. Since the wire harness they give you has a big plug on one end, I actually ended up cutting it off, inserting the wire ends through a new hole in a rubber grommet going through the firewall, and then re-soldering the wires back together to the plug afterwards. I used the same firewall hole that I used for my DRL install. (See here). 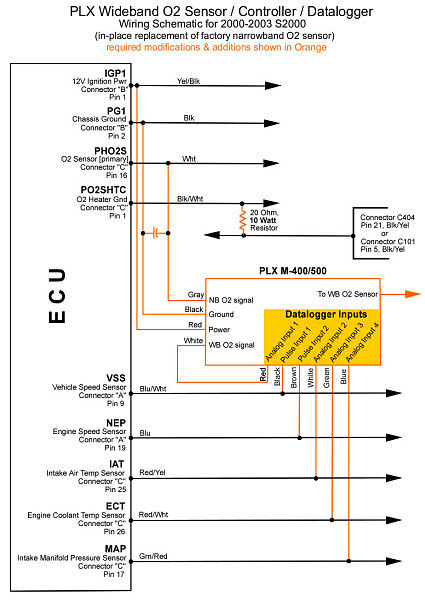 2) As per my wiring diagram, connect the power and ground of the PLX device to the appropriate spots near the ECU (apparently it is important to splice in close to the ECU, according to the instructions). 4) splice the gray wire of the PLX control/display into the 02 sensor input of the ECU (see my wiring diagram). 6) splice the 20 ohm resistor into the wiring as described in the diagram (note: this resistor is not supplied in the kit - you'll have to buy one). Connectors C101 or C404 are not obvious to find - Picture 5 shows the location of C404. C101 resides behind the kick panel and below the ECU's connectors - don't have a picture for this one, though - refer to the factory electrical manual for the picture of that. In any case, this resistor will fool the ECU into thinking that the stock factory 02 sensor's heater circuit still exists. Make sure this is a TEN WATT Resistor (these often look like a white block of ceramic - they need to be able to take the heat!). When the car is running, current will be flowing through this resistor, and it will get fairly hot. Make sure you mount the resistor such that it isn't touching anything, like wires, paper, plastic, etc. Although I don't think it gets hot enough, I wouldn't want you to start a fire! 7) using the adhesive velcro strips, mount the display/control unit somewhere where you can see it. I mounted it under the dash on the left side, right next to the driver's door. (see picture). 8) at this point, you should be able to test the basic functioning of the system. Re-connect your battery. If you've connected everything up properly, when you turn the engine on, you should see the PLX device's LED display light up. After a few moments, you'll note the display go very lean, and then it will actually display 'LEAN'. This ok and normal. It seems that the air pump mechanism on the s2000 deliberately creates an extra-lean condition upon startup (probably for emissions reasons). After a minute or so of this, you will actually hear the air pump stop operating (a faint whine that suddenly stops), and at the very same moment, the PLX device's display should drop down to roughly stoichiometric (it'll bounce around 14.5 to 15.0). So far, so good. You should have no Check Engine Light, and the 20 ohm resistor should be getting hot to the touch by this point. 9) if all is well, go for a spin. You'll note that when in gear with no throttle, fuel is cut completely, and the display reads 'LEAN'. If you go much beyond part throttle or all the way to WOT, you'll see the display go down to the 12-ish range (richer). Otherwise, the display should stay roughly in the 14 to 15.5 range (it bounces around a bit). If all this happens, then everything is operating normally. 10) If you have an M-400 or M-500 unit, you can now think about splicing the sensor inputs into the datalogger. You may choose to follow the schematic I have below and wire in the sensors I chose to monitor. The instructions for the PLX device show what datalogging wires are for what datalogging input. 11) Fire up your laptop and install the PLX software and wireless USB driver. Then plug the antenna into the USB port and run the software. (oh, and make sure the ignition power is on and the PLX controller is on. Once you've selected the right USB port for the antenna, you should start to see packets coming in and the gauges should start operating. The gauges will not be calibrated so the values may not make sense. I have created a set of calibrations (available here that you can use. However, my calibrations are not fully correct yet). One further note: The setup is very picky with regards to antenna positioning. Even with the antenna close (ie - line of sight, less than one foott away) to the PLX device's antenna, I still sometimes got significant packet loss. I ended up getting a USB extension cable so I could position the antennae close together. I almost think that wiring the coax cable directly to the USB device might be a better choice. Apparently PLX sells the kit configured this way and/or offers a "wired" option.